"They're famous," says 16-year-old Joseph*, a member of a youth music project in Ipswich. "They would be recognised around here, 100%," agrees his collaborator Ethan*, who is also 16. In 2019, it's entirely possible to be known by almost every young person in a town with a population of more than 130,000 people, thanks to the democratising effects of YouTube. If you have something to say and can say it compellingly enough, the audience will find you. YTBYTN's tracks have an ominous feel, with bleak and gritty lyrical content that covers themes of street life, poverty and violence. As well as appealing to their own age group, YTBYTN have a following among the town's pre-teen children, as Ipswich community worker Cad Taylor points out. "We have done work in primary schools with lots of young children that know the lyrics, and there is some kind of thing around local celebrity status, however negative some of those things portrayed are." In the wake of a spate of recent knife killings, the music of YTBYTN was even raised in the Commons by Ipswich's Labour MP Sandy Martin, who said he'd only just learned of the existence of the videos. Speaking in Parliament, he told Home Secretary Savid Javid that "we cannot afford to have this sort of glamorisation of a gang lifestyle still available on social media". Two rival groups of young males engage in a "turf war", in this case J-Block versus Neno. They start trading insults and, before long, their exchanges become violent. Rivalry between YTBYTN - who identify with the J-Block gang - and the other group can be seen in the videos. That group, which uses the name DaRealSideofIpps on YouTube, can been seeing spraying their tag in rival J-Block "territory", even filming Calver looking out of his window. Tavis himself can be spotted in these music videos, which according to US hip-hop expert Prof Murray Forman were "something adjacent at the very least" to his murder. Most of the YTBYTN videos have a professional and crafted look to them. 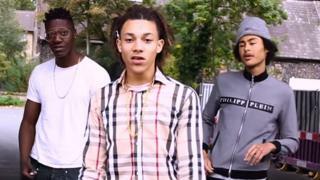 In one video, Davies, who performs using the name Youngz, sings: "That is Youngz, can I have a picture please? 'Course you can, but can you be quick? I've got a pack on me, and I've just seen CID'." Despite some "questionable life choices", Davies, Calver and Yenge "found their own niche", according to Ipswich youth worker Mark Straw. He says the town's youth service, which has since become part of the larger children and young people directorate, previously recognised the "value of supporting young people" and "celebrated youth sub-culture". They used to have youth workers at schools, youth centres and "professionals young people could access if they needed to", he explains. "These guys [YTBYTN] have got talents, these guys have got skills, these guys have created their own beats, these guys have got ideas, innovation, an entrepreneurial outlook on life," he says. "Why can't we actually work with those young people to increase a level of accountability or responsibility? I can't say you can take a horse to water and it'll drink, but we can provide some sort of connections. "One of the first tracks they put out, the guys say 'look at what you've created' - they're a product of the system." In one of their biggest-hitters, Poverty, which has more than 140,000 views on YouTube, they sing: "I just want to leave the hood and all the poverty." Mr Straw, who has been involved in youth work for 25 years, describes it as a "real revelation" and a "beautiful tune". 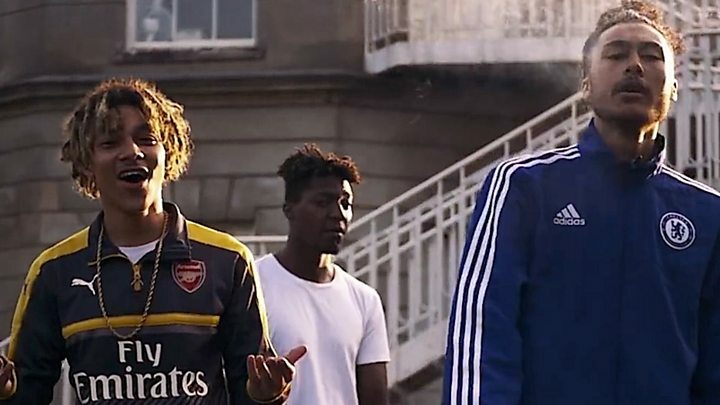 Their earliest track, the 120,000-hitter I Founda Plug, is about making money through selling drugs, with the lads parading their ￡500-plus Giuseppe Zanotti designer trainers in the video. In it, the collective sing "behind bars, that's where all my friends are". I Founda Plug is "the one most kids know", says Ms Taylor, a trustee of Ipswich Community Media. She says the children "may not understand the references being made in the language" but they "certainly love to sing that song". "Which means the song is accessible interestingly to kids - they just sing it," she says. Charlize Nicholas, 14, who lives in a village just outside Ipswich and is part of a community music project, says: "People look up and see people who are local and they are almost role models - people older than them who they know are local and they are getting these minutes of fame. "It's something for them to look up to." "You are looking for role models and, unfortunately, if someone is making music and everyone is singing their songs, then that becomes your role model." She says I Founda Plug attracted "negative attention", but Davies and Calver were only 14 and 16 at the time and it was "a part of them being children and not listening". What's more, trap music was "very popular" and YTBYTN wanted to make "music that was fashionable". "They hit 30,000 views within two weeks," she says. "You thought 'this could be perceived wrong', but once they put one out, there was no stopping them." Prof Forman says that what's interesting about the music is "they're doing everything right and well enough to be appealing". He says that while the "freeform and amateurish" videos are "entirely conventional in the genre", they have an "authenticity that other youths in the region might respond to favourably or sympathetically". He adds: "The videos convey a playful effect that can also be appealing. "The youths joke around, act the fools, and in the instances where the production is clumsy, they seem to openly acknowledge and laugh at their foibles." For University of Suffolk criminologist Dr Paul Andell, the "generalised patterns" seen in trap music videos tell a story "not as a direct representation of reality but a looped reality". He says in such instances what can happen is that the "street scripts the screen and the screen scripts the street". "In this looped reality, each click on to YouTube is a repeated disrespect, where the virtual violence of lyrics can take a real turn." He adds: "Myth-making is a recognised characteristic of gang culture and these myths are often propagated by YouTube clips; this consigns gang affiliates into a 'wannabe' status. "In sub-cultural terms, wannabes are quite dangerous because they will go the extra mile to be noticed." He says the size of Ipswich, which is one of the bigger towns in the country, is "relevant in these terms". During the trial, Davies spoke openly about dealing Class A drugs from the age of 13 and "reloading" crack cocaine from his supplier. The trio, with others, "hunted their prey and showed no mercy" as they purposely travelled across Ipswich and stabbed Tavis 15 times, smashed a bottle over his head and left him to die. Police say the gang members were very well known to officers and if Tavis hadn't been killed, then "almost certainly" someone else would have been. The Suffolk force set up a youth gang prevention unit in March 2017 "because of those boys", according to a police officer who works undercover in Ipswich. He says they tried to steer them away from crime but it "was quite clear they weren't going to change their ways", and police eventually "exhausted all the ways" they could "feasibly and reasonably" help them. The youth and community worker, who presents BBC Introducing in Suffolk, says: "Music is free expression and something they were good at, and they had room for development.